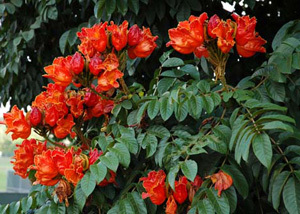 Spathodea campanulata (African Tulip Tree), also known as Flame of the Forest or Fountain Tree originally came from Africa near the equator. This magnificent flowering tree grows very wide, creating a large canopy covered with upward facing red/orange tulip like blooms with crimped edges. After the blooms, come seed pods that split, allowing the wind to carry the seeds away, making this a potentially weedy tree. It is very fast growing, eventually reaching 50 to 80 feet high and nearly as wide. The leaves are shiny and evergreen. Propagation is from seeds, cuttings and root suckers. This tree is tolerant of salt air. Its beauty is well known in tropical parts of the world.